I think rotary cutting may be the best invention in sewing, (after the sewing machine, of course). If you've never used one before, give it a chance and it'll change your life. It's hard to go back to cutting with scissors again after trying one. I didn't have one with me when I moved away from home, as it belonged to my mother, and then I just never bought one, because starting over with buying the mat, cutter and ruler could be expensive. I always came up with an excuse how I could just do without. I even made a full size quilt one time without the use of rotary cutting. Those of you who do a lot of quilting are probably shaking your head at the thought of me putting myself through that long drawn out process of hand cutting each piece. I'm right there shaking my head along with you. It did take a long time and I don't think I'm going to do that again anytime soon. I don't know how they did it in the old days before the invention of rotary cutting. I guess they probably didn't have as much going on in their lives as we do now, but, let's face it, no one likes cutting things out. It's boring and time consuming and we just want to get to the sewing! If you're wondering why someone would go on and on about a simple cutting process, you'll want to check out the Professor Pincushion video on rotary cutting. 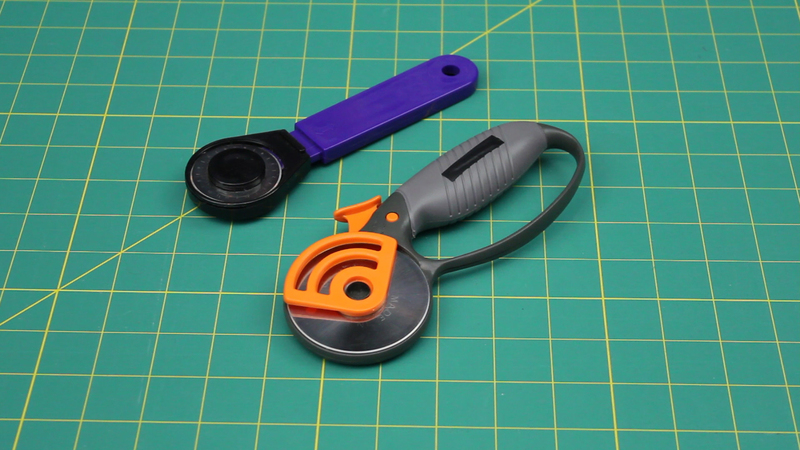 I go over not only the rotary cutting accessories, but also how to take care of them and how to use them. Not only does it make cutting out things easier, but you'll be able to cut out pieces more accurately, which makes sewing pieces together easier. Trust me, my hand cut quilt pieces were not the most perfect. And rotary cutting is helpful in almost all your projects, not just quilting. No one was happier than me to be reunited with a rotary cutting set and I use it all the time. Thanks, Mom! If you have any other rotary cutting tips and tricks not mentioned in the video, please post about them in the comments below. We always love to learn new things! Loved this video, very informative, thank you! I did have to laugh when you said “never grab it by the blade” and then a few seconds later when demonstrating how to change the blades you just grabbed it with your bare hands. The trick to using a rotary cutter with apparel is to use a clear ruler along the edges. Then apply pressure to the ruler as you guide the rotary cutter along the edge of the ruler. I use a 6×24 inch clear ruler, and prefer to cut on the floor, so I can use a knee or two to weigh down one end of the ruler, while using my free hand to press the ruler down on the other end. For smaller pieces, and tight curves, I use a smaller clear ruler. Or you can switch to scissors for the details after getting the long/straight cuts done. My cuts are almost perfect with a rotary cutter, compared to the mess I make with scissors. I have to clean up my scissor cuts with the rotary cutter. The cleaner edges I get from the rotary cutter also helps sew straight lines. So it helps to go slow until you get enough practice with cutting with the rotary cutter. I mainly use my scissors for cutting free-hand. I practice sewing techniques making clothes for my dog. She’s able to sit still like a mannequin, but I don’t pin the fabric when assessing the fit. I just grab close to where I want to alter, then use my scissors to cut. I alter baby and toddler clothes for her. If I had a human dress form, I’d alter a lot of clothes for myself using similar techniques. But I don’t have one, yet. Good idea to use the cans. buena idea usar las latas. this is very helpful because my hand inst very steady with scissors. Some people are super comfortable with rotary cutting out everything. I much prefer using scissors for all my apparel cutting, but I don’t have really steady hands so I feel like scissors give me much better control. I do use the rotary cutter if I’m going to be cutting nothing but straight lines like for quilting. Do you prefer using the rotary cutter for cutting out patterns in the fabric? Another great video!! I really like the idea of using cans for weights! I will trade you 4 O’Weights for 4 of your cans.